* Some products listed in this page are "Race-only" parts, which are legal for sale or use in CA only on vehicles which may never be driven on a public highway. JDM - Limited Edition TRUST Comfort Sports GTS Ver.2 exhaust. CS GTS Ver.3 (JDM quad tip) - NEW! JDM - Limited Edition TRUST Comfort Sports GTS Ver.3 exhaust. Airnix GT - Drop in Air Filter Replacement - NEW! Fits Toyota 86 (MT) Subaru BRZ (MT) "Kouki"
Dry Element with cast Aluminum intake pipe. GReddy Air Intake Snorkel delivers more cool air into the factory air box, while carefully routing air from the front grill. The unique FRP shape promotes air flow to the filter element. Mounting brackets and hardware included. Cool air intake tempatures provide improved performance and efficiency. * compatiable with GReddy Circuit Spec Oil Cooler Kit. FA20 aluminum water neck, with built in bracket, water temp adaper. Fits OEM and GReddy Type N radiator cap. Allows for safe 1/8PT water tempature sensor mounting in the upper radiator hose. Includes 8mm dia. house union for water overflow, and optional 1/8PT plug cap. Aluminum - anodized blue, with GReddy logo. Oil Pan Baffle Plate - NEW! Aluminum baffle plate with a shark duct that balances engine oil to prevent oil pick up problems. Smooth oil directing to oil pick up. Increase stablity for oil pressure. Ideal for high G-loads. Both cornering and acel / decel situatations. compatiable for N/A or GReddy turbo applications. Attaches inbetween the M18 port on a GReddy Oil Cooler Block adapter and the AN fitting line. Used to easily mount standard 1/8PT tempature and pressure sensors. includes necessary gaskets, heat shields, couplings, hose, mounting brackets, etc. In many states, it is unlawful to tamper with your vehicle’s emissions equipment. GReddy / GPP (GReddy Performance Products, Inc.) products are designed and sold for sanctioned off-road/competition, non-emissions controlled vehicles only and may never be used on a public road or highway. Using GReddy/GPP products for street/road use on public roads or highways is prohibited by law unless a specific regulatory exemption exists (more information can be found on the SEMA Action Network website: www.semasan.com/emissions for state by state details in the USA.) It is the responsibility of the installer and/or user of this product to ensure compliance with all applicable local and federal laws and regulations. Please check with your local vehicle authority before purchasing, using or installing any GReddy/GPP product. Legal for sale or use in CA only on vehicles which may never be driven on a public highway. GPP Tuner Turbo Kit GTX 2867R Gen II - NEW! Winner of the 2018 Dsport Magazine's 86 (Forced Induction) Challenge - GPP GTX2867R-Gen2 Tuner Turbo Kit! * NOTE: Replacement, low profile radiator fans required for installation. GReddy Performance Products is proud to add the full line of Turbo by Garrett GTX-R turbochargers to our GReddy/Mitsubishi line-up. With more options to better match the ideal turbocharger(s) to each specific application, look for more aggressive turbo kits from the GPP Turbo Kit line. The latest addition to our FR-S/86/BRZ Tuner Turbo Kits is our Version 3, GTX-R Tuner Turbo Kit for the 2012-2017 FR-S, 86 and BRZ. Designed around a powerful Garrett GTX-2867R Gen II (with a rated range of 275-550hp,) this updated kit features a larger, centered GReddy Type-24 intercooler and all the necessary hardware for a versatile tuner kit, that will be an ideal fit for both stock FR-S/86/BRZ engines, as well as fully strengthened FA20 engines. 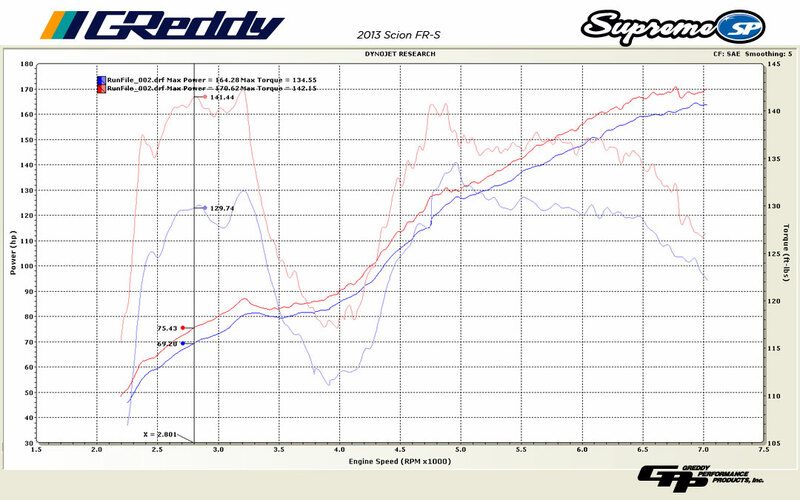 Engine strengthening is crucial for safety and reliability of FR-S and BRZ over the 350hp mark. GReddy engineers have drawn from our FR-S race experience to assemble a complete stroker kit for the FA20/4U-GSE boxer engine, using only superior components. The kit features 9.5:1, 86mm bore. 2618 T6 forged aluminum pistons with specially designed shape ideal for high boost applications. This is connected to extra strong H-beam 433OM steel alloy forged connecting rods with a factory style 18deg. split line. And at the heart of the 2.1L kit is our dynamic balanced, E4340 Cr-Ni-Mo alloy billet steel stroker crankshaft. see our blog for more on this kit. Front Bumper - FRP -1pc. Side Skirts - FRP -2pcs. Front Over-Fender set +65mm - FRP -4pcs. Rear Over-Fender set +90mm - FRP -4pcs. Front Canards - FRP - 2pcs. Side Canards - FRP - 4pcs. Rear Canards - FRP - 6pcs. Rear "Duck-tail" wing - FRP - 1pc. Rear GT Wing set - FRP - 1pc. Rocket Bunny Wide-body Aero Kit - Version 2. Front Over-Fender set +45mm - FRP -4pcs. Rear Over-Fender set +70mm - FRP -4pcs. Speedhunters preview the new Version 2 aero kit. Custom made canards for Dai Yoshihara’s Formula D race car is now available to all the Rocket Bunny Ver.2 kit owners. Rear Duck Tail Wing from the Version 2 Kit. Front Bumper from the Version 2 Kit. Front Splitter from the Version 2 Kit. V2 Front Bumper - 17010231"
Side Skirts from the Version 2 Kit. Rear Under Diffuser from the Version 2 Kit. Front Fenders & Front covers for the Bumper from the Version 2 Kit. Rear Fenders & Rear trim for the Bumper from the Version 2 Kit. V2 Front Fenders - 17010234"
GReddy X Rocket Bunny Wide-body Aero Kit with GT Wing - Version 1. 1. Front Lip Spoiler - FRP (FR-S / 86 bumper requried) -1pc. 2. Side Skirts - FRP -2pcs. 3. Front Over-Fender set +45mm - FRP -4pcs. 4. Rear Over-Fender set +70mm - FRP -4pcs. 5. Rear Under Diffuser +60mm - FRP -1pc. 6. GT Rear Wing set - FRP -7pcs. GReddy X Rocket Bunny Wide-body Aero Kit (12pcs.) - Version 1. Front Lip Spoiler - FRP (FR-S / 86 bumper requried) -1pc. 1600x380mm GT Wing plane with uprights and trunk mounts. Front Lip Spoiler from the Version 1. Side Skirts from the Version 1. Front Over-Fender and Bumper Trim from the Version 1. - installs on factory front fender. Rear Over-Fender and Bumper Trim from the Version 1. - installs on factory fender. Rear Under Diffuser from the Version 1. Designed for OEM weight hoods.